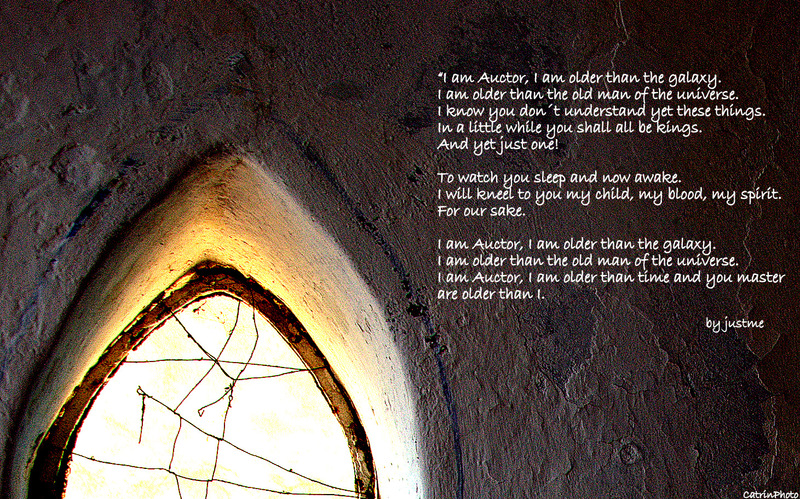 I am Auctor, I am older than the galaxy. I am older than the old man of the universe. they could just see, a world within a world, within a world. As I look upon you. From my heaven I watched the show. I seen how you as gas and dust gathered and contracted. And the atmosphere, ah, what a good idea. Just a day ago, just a day ago to me. I exhaled as you formed but with no strength upon your spine. so perfect, everything just right. And I was glad. I was so glad that day. First with stump and bone from birth. As this pendulum you swung. They knew I watched. They knew I listened. No more you will cry. Speak no more of size and number. One hundred billion stars you say! In this place you call your milky way. as large as your imagination. I will kneel to you my child, my blood , my spirit. Reblogged this on The Living Room.